The term phonation has slightly different meanings depending on the subfield of phonetics. 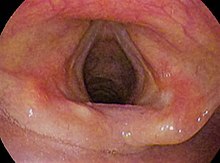 Among some phoneticians, phonation is the process by which the vocal folds produce certain sounds through quasi-periodic vibration. This is the definition used among those who study laryngeal anatomy and physiology and speech production in general. Phoneticians in other subfields, such as linguistic phonetics, call this process voicing, and use the term phonation to refer to any oscillatory state of any part of the larynx that modifies the airstream, of which voicing is just one example. Voiceless and supra-glottal phonations are included under this definition. The phonatory process, or voicing, occurs when air is expelled from the lungs through the glottis, creating a pressure drop across the larynx. When this drop becomes sufficiently large, the vocal folds start to oscillate. The minimum pressure drop required to achieve phonation is called the phonation threshold pressure, and for humans with normal vocal folds, it is approximately 2–3 cm H2O. The motion of the vocal folds during oscillation is mostly lateral, though there is also some superior component as well. However, there is almost no motion along the length of the vocal folds. The oscillation of the vocal folds serves to modulate the pressure and flow of the air through the larynx, and this modulated airflow is the main component of the sound of most voiced phones. The sound that the larynx produces is a harmonic series. In other words, it consists of a fundamental tone (called the fundamental frequency, the main acoustic cue for the percept pitch) accompanied by harmonic overtones, which are multiples of the fundamental frequency. According to the source–filter theory, the resulting sound excites the resonance chamber that is the vocal tract to produce the individual speech sounds. The myoelastic theory states that when the vocal cords are brought together and breath pressure is applied to them, the cords remain closed until the pressure beneath them, the subglottic pressure, is sufficient to push them apart, allowing air to escape and reducing the pressure enough for the muscle tension recoil to pull the folds back together again. The pressure builds up once again until the cords are pushed apart, and the whole cycle keeps repeating itself. The rate at which the cords open and close, the number of cycles per second, determines the pitch of the phonation. The aerodynamic theory is based on the Bernoulli energy law in fluids. The theory states that when a stream of breath is flowing through the glottis while the arytenoid cartilages are held together (by the action of the interarytenoid muscles), a push-pull effect is created on the vocal fold tissues that maintains self-sustained oscillation. 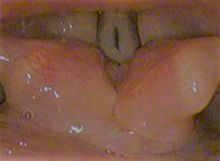 The push occurs during glottal opening, when the glottis is convergent, and the pull occurs during glottal closing, when the glottis is divergent. Such an effect causes a transfer of energy from the airflow to the vocal fold tissues which overcomes losses by dissipation and sustain the oscillation. The amount of lung pressure needed to begin phonation is defined by Titze as the oscillation threshold pressure. During glottal closure, the air flow is cut off until breath pressure pushes the folds apart and the flow starts up again, causing the cycles to repeat. The textbook entitled Myoelastic Aerodynamic Theory of Phonation by Ingo Titze credits Janwillem van den Berg as the originator of the theory and provides detailed mathematical development of the theory. This theory states that the frequency of the vocal fold vibration is determined by the chronaxie of the recurrent nerve, and not by breath pressure or muscular tension. Advocates of this theory thought that every single vibration of the vocal folds was due to an impulse from the recurrent laryngeal nerves and that the acoustic center in the brain regulated the speed of vocal fold vibration. Speech and voice scientists have long since left this theory as the muscles have been shown to not be able to contract fast enough to accomplish the vibration. In addition, persons with paralyzed vocal folds can produce phonation, which would not be possible according to this theory. Phonation occurring in excised larynges would also not be possible according to this theory. If the arytenoid cartiledges are parted to admit turbulent airflow, the result is whisper phonation if the vocal folds are adducted, and whispery voice phonation (murmur) if the vocal folds vibrate modally. Whisper phonation is heard in many productions of French oui!, and the "voiceless" vowels of many North American languages are actually whispered. In languages such as French, all obstruents occur in pairs, one modally voiced and one voiceless: [b] [d] [g] [v] [z] [ʒ] → [p] [t] [k] [f] [s] [ʃ]. In English, every voiced fricative corresponds to a voiceless one. For the pairs of English stops, however, the distinction is better specified as voice onset time rather than simply voice: In initial position, /b d g/ are only partially voiced (voicing begins during the hold of the consonant), and /p t k/ are aspirated (voicing begins only well after its release). Certain English morphemes have voiced and voiceless allomorphs, such as: the plural, verbal, and possessive endings spelled -s (voiced in kids /kɪdz/ but voiceless in kits /kɪts/), and the past-tense ending spelled -ed (voiced in buzzed /bʌzd/ but voiceless in fished /fɪʃt/). A few European languages, such as Finnish, have no phonemically voiced obstruents but pairs of long and short consonants instead. Outside Europe, the lack of voicing distinctions is common; indeed, in Australian languages it is nearly universal. In languages without the distinction between voiceless and voiced obstruents, they are realized as voiced in voiced environments, such as between vowels, and voiceless elsewhere. For a subset of a language used in a particular social setting, see Register (sociolinguistics). ^ a b c Titze, I.R. (1988). "The physics of small-amplitude oscillation of the vocal folds". Journal of the Acoustical Society of America. 83: 1536–1552. doi:10.1121/1.395910. PMID 3372869. ^ a b Lucero, J. C. (1995). "The minimum lung pressure to sustain vocal fold oscillation". Journal of the Acoustical Society of America. 98: 779–784. doi:10.1121/1.414354. ^ a b Lucero, J. C. (1998). "Optimal glottal configuration for ease of phonation". Journal of Voice. 12: 151–158. doi:10.1016/S0892-1997(98)80034-9. ^ a b Zemlin, Willard (1998). Speech and hearing science : anatomy and physiology. Allyn and Bacon; 4th edition. ISBN 0-13-827437-1. ^ a b Titze, I. R. (2006). The Myoelastic Aerodynamic Theory of Phonation, Iowa City:National Center for Voice and Speech, 2006. ^ a b c d e f g h Ladefoged, Peter& Ian Maddieson. (1996). The Sounds of the World's Languages. Cambridge, MA: Blackwell. ^ Laver (1994) Principles of Phonetics, p. 189 ff, 296 ff, 344 ff. ^ a b c d e Edmondson, Jerold A.; John H. Esling (2005). "The valves of the throat and their functioning in tone, vocal register, and stress: laryngoscopic case studies". Phonology. Cambridge University Press. 23 (2): 157–191. doi:10.1017/S095267570600087X.